Close up of Yvonne Strahovski's sunglasses. Click on the image for an enlargement. 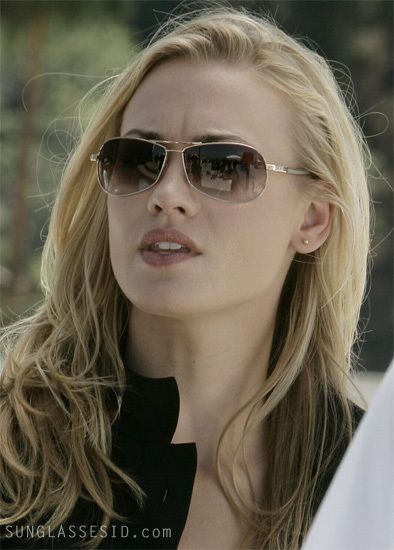 Yvonne Strahovski (as Sarah Walker) wearing a pair of aviator sunglasses in the television series Chuck. Yvonne Strahovski wears a pair of Anon Informant sunglasses with a gold frame and gradient lenses in the television series Chuck. The Anon sunglasses can clearly be seen in Season 1, Episode 11, 'Chuck Versus the Crown Vic'. Click on the photos to see a larger version. The little engraved Anon logos on the side of the arms (in the gold part) are clearly visible. These Anon Informant sunglasses come in different color combinations and had a suggested retail price of $125 but are currently not available anymore.